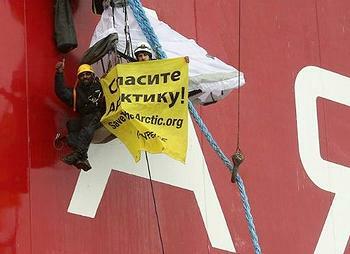 MOSCOW, Russia, August 24, 2012 (ENS) – A team of six Greenpeace International activists, led by Executive Director Kumi Naidoo, boarded Gazprom’s ‘Prirazlomnaya’ Arctic oil platform early this morning to demand that the Russian company abandon its Arctic drilling plans. At 4am local time the activists set off in three inflatable speedboats from the Greenpeace ship Arctic Sunrise and scaled the platform via mooring lines. They are perched in various locations on the platform, interrupting operations. They have hung a banner reading, “Don’t Kill the Arctic”. The activists say they are out of reach and have enough supplies to last for several days. The expiration means that the Gazprom platform is operating without an official oil spill response plan. Gazprom’s response plan was approved in July 2007 for a period of exactly five years. The Russian Ministry of Emergency admitted to Greenpeace in a letter that a new spill plan has been neither submitted nor approved. Russian energy giant Gazprom plans to begin full commercial drilling operations by early next year, becoming the first company to start commercial oil production in the offshore Arctic. Greenpeace Russia told the Russian news agency Itar-Tass that water cannons are being used against the activists. “Two helicopters landed on Prirazlomnaya during the action. It is possible their passengers would detain the activists. Meanwhile, oil rig personnel are trying to wash the activists off the rig. 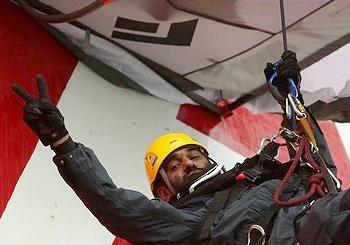 The activists say they hold the ground but they are wet and cold,” said a Greenpeace Russia spokesperson. The Prirazlomnaya oil rig personnel have prepared rescue equipment in case the Greenpeace activists on the rig need help, the rig manufacturer, Sevmash defense shipyard in Severodvinsk, told Itar-Tass. “The scientists calculated 60,000 different scenarios if an oil spill were to occur at this platform, and their research showed very clearly that in fact it would take the company days to mount a serious response. Meanwhile, the toxic oil would reach the shores of three protected wildlife and nature reserves in just 20 hours,” Naidoo wrote. The Prirazlomnoye field was discovered in 1989 in the shallow Pechora Sea in Russia’s northwest. The field is located on a shelf 60 kilometers (40 miles) off the shore of the Varandey settlement at the water depth of about 20 meters (65 feet). Gazprom says the Prirazlomnoye field contains 72 million tons of oil reserves, from which the company hopes to achieve an annual production level of 6.6 million tons.